Edurne García Almagro was born 22 December 1985 in Madrid. From the early age she was music fan and usually went with her parents and friends to karaoke. Edurne started attending auditions as a child. At 9, she became a member of children's music group "Trastos", recording three albums with them. She also had minor roles in TV series like "Hospital Central" (2002) and "Ana y los 7" (2003). In late 2005, Edurne auditioned for the fourth series of "Operación Triunfo". She was selected and she was eliminated in the 12th live show, finishing in sixth place. Edurne embarked on a music career with Sony BMG Spain and released her first studio album "Edurne" (2006) which saw the release of three successful singles, the lead single from the album "Despierta" debuted at number five on the Spanish charts. Album peaked at number 3 in the Spanish charts in its first week, being sold a total of 60,000 copies in Spain and getting a "Gold disc". 2007 saw the release of Edurne's second studio album "Ilusión", which produced two singles, the first being "Ven Por Mí". Edurne released her third album "Première" with covers mostly of the songs from popular musicals on 4 June 2008, with lead single "Un Poco de Amor", Spanish version of Queen's song "Somebody to Love". "Sigo Enamorada de Ti" ("Hopelessly Devoted To You") and "Tú serás para mí" ("You're The One That I Want"), both Spanish versions of the "Grease" soundtrack, were the following singles. Edurne was playing Sandy in "Grease, El musical de tu vida" in 2007-2009 and 2011-2013. 2010 saw the release of Edurne's fourth studio album "Nueva Piel", made mostly in dance-pop style, which produced two singles "Soy Como Soy" and "Oigo Mi Corazón". The disc came 16th in the list of the most sold CDs and peaked at number 2 on digital downloads on iTunes. This year, Edurne joined the cast of "¡Más Que Baile! ", the Spanish version of Strictly Come Dancing, where she took the second place in the final. Edurne released her fifth studio album "Climax" on 24 September 2013, with lead single "Pretty Boy". She worked on CD in London and Stockholm with producers Pablo Navarro and Simon Nordberg. In December 2013 Edurne made a special collaboration on the song "Hand On Heart" with Olly Murs. In 2013, Edurne joined the cast of the third season of "Tu Cara Me Suena" (Your Face Sounds Familiar), a Spanish show where celebrities impersonate singers for charity, where she also was proclaimed winner with the 60% of popular votes with her Christina Aguilera impersonation and her song "Hurt" in the show's finale. She also became guest in Portuguese version of the program. From June to December 2014, Edurne presented comedy show "Todo va bien", along with Xavi Rodríguez, on Cuatro. She quit the show to focus on her music career and Eurovision participation. During her music career Edurne has earned one 40 Principales Award nomination, for "Best New Artist" in 2006. She also was nominated for "Best Female Pop Singer" at Cosmopolitan Awards 2008, for "Singer of the Year" at "Must! Awards" 2010 and "Best Artist" at "Must! Awards" 2011. She became winner of "Must! Awards" 2011 for Best Video for "Oigo mi corazón" and "Female Voice of the Year" at "Propolis Awards 2014". Edurne, who was voted voted "Sexiest woman of the year" in Spain in 2010 by the readers of FHM magazine is dating Manchester United goalkeeper David de Gea for the past four years. 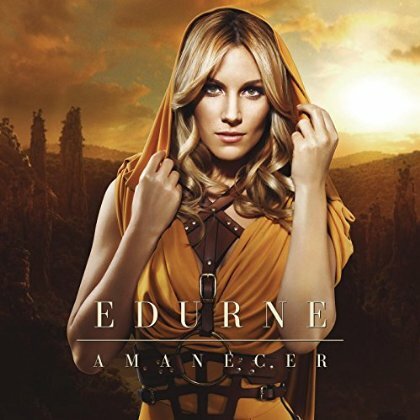 On 14 January it was confirmed that Edurne has been chosen for Eurovision Song Contest 2015 internally by Spanish Television with a song fully in Castilian Spanish called "Amanecer" which means "Break Of Day". Edurne described it herself as a "quality pop" song. The song is also set to be included in her sixth studio album; CD made with producer Tony Sánchez-Ohlsson, that she has started recording in January. The composer is Tony Sanchez-Ohlsson (ESC 2007 and 2012), Peter Boström (Norway and Sweden 2012), and Thomas G:son. It will be G:son's 9th ESC entry (Sweden 2001, 2006, 2012, Spain 2007, 2012, 2015, Norway 2007, Denmark 2010, Georgia 2013). At the press-conference singer explained that she felt in love with the song from the first listen and the song was the reason for her to agree on RTVE proposal. "Everything followed the song, which I'm sure can work in Eurovision, even though it is a very different compared to everything usually heard at the contest. But with this innovation we get the opportunity to reach the first spot". Watch video-conference of Edurne here (in Spanish). "I'm very happy and am looking forward to May to give it my all. Perhaps this is the most important thing that has happened in my career ever. I know it's a huge challenge and a huge responsibility and I will give it my best shot. I would be happy to finish in the best position possible. I'm going there to win, if you don't want to win, then do not go. So my task is to become number one!" TVE will air both semifinals of Eurovision Song Contest 2015 on La 2 with Julia Varela and José María Iñigo expected to be in charge of the final commentary on La 1. It also has been revealed that entrance fee for Spain this year will be 356,000 Euros. The web program #Edurnevision has released the exclusive video of symphonic version of "Amanecer" which was recorded at the Teatro Monumental in Madrid in March. 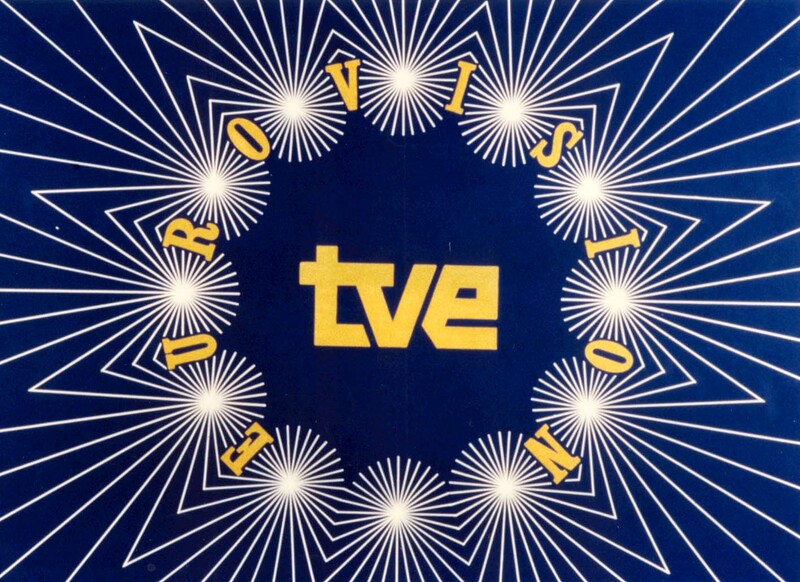 Participation in the Eurovision Song Contest 2014 has costed RTVE 386,994 euros, as reported by the president of RTVE, José Antonio Sánchez, in a parliamentary answer. The amount is slightly higher than in 2013 - 379,893 euros. Before drop down in 2013, RTVE costs have been raising every year: 382,742 euros in 2010, 418,102 in 2011 and 426,483 in 2012. For this year, the president of RTVE informs in parliamentary answer the final budget is not fixed yet. It is known that RTVE will pay 356,000 euros just to take part in the competition, but this amount does not include travel, accomodation and other expenses that Spanish delegation will face in Vienna. Despite the high cost, investment in Eurovision is profitable for the public broadcaster. Last year, the show was followed by 5.141 million viewers (35.2% share), becoming the most watched non-sporting program of the year in Spain. Participation in Eurovision also costs half lower than Cuéntame or Águila Roja (between 700,000 and 800,000 euros) and far less than the rights of any sports competition. One match of Spanish national football team costs for public television 1.95 million euros. Today, at a press conference in Malaga, took place the presentation of the artist and the official song theme of the next edition of the Vuelta a España Tour: the song 'Amanecer', of Edurne, who will represent Spain in the next Eurovision Song Contest to be held in Vienna on May 23, will also become the official song of the 2015 Vuelta, starting from August 22. The singer will start tomorrow shooting the official video spot in different locations in the province of Málaga, and it will be premièred shortly on TVE. "I'm so happy because it means that 'Amanecer' success does not end with Eurovision, it will be played all the summer"
said the singer, who thinks her Eurovision entry conveys the strength and energy that cyclists need to face at the Spanish cycling race. Giuseppe Di Bella has been introduced as the dancer who accompany Edurne at Eurovision. Born in Sicily 28 years ago, Giuseppe came to Spain eight years ago as a student of Erasmus, in order to study law at the Complutense University of Madrid. He finished the course (now being educated lawyer specialized in Entertainment Law), but decided to pursue his passion: dance. In Spain the opportunity for him arose to work as a dancer in television programs, and to date he has worked on a dozen of them, including such TVE programs as El disco del año 2009, Con el vértigo en los talones, ¡Estamos contentos? and Amar en tiempos revueltos. He has also worked in theater as part of the cast of 40 El Musical and Dance Company Aguanile. His professional experience extends beyond the dance, participating as an actor and dancer in movies Solo química of Alfonso Albacete, and Torrente 4 of Santiago Segura. Besides dancing, another his passions is the communication. In fact, he currently combines his work on the stage with his work as a radio host of the Sospechosos Habituales. Di Bella also participated in the music video for "Dancing in the rain" (Eurovision 2014). Giuseppe Di Bella and Edurne have worked together on previous programs. Edurne has been actively rehearsing her Eurovision stage presentation in RTVE studios in Prado del Rey. Her rehearsals were recorded and sent to the technical team of the Eurovision, which will begin preparations to ensure that "Amanecer" presentation looks spectacular on the screen. Singer is not revealing any details of her stage presentation, saying: "I want to keep the magic of the performance to be a surprise for everyone. I am delighted we have found the key to give elegance, strength and presence to the subject. Although there still are two months before Eurovision, this is the most important thing", explains Edurne. Edurne is helped by professional team of choreographers, dancers and actors. For the first time Edurne will be performing her song live on 6 April in program "Alaska y Segura" broadcasted on La 1 at 23.50. Edurne does not want to happen the same thing that occurred to Ruth Lorenzo in Copenhagen where she had to change at the last minute her dress, specially designed for the occasion, so her team is now carefully working with exact stage lighting that will be in place in Wiener Stadthalle. So far, only designer of the dress, Jose Fuentes from Barcelona, has been named. Fuentes has also created the outfits of Edurne for "Amanescer" music video. "It will be a wonderful dress. Europe will be amazed," Fuentes says to Rafa Muñoz, head of fashion blog "La vida al bies" of rtve.es. "Edurne is very open and likes to listen to the views of others", he adds and concludes that "the surprise effect in Vienna will first of all be her, Edurne, herself". Edurne is already doing visits to "Atelier de Fuentes" and said the following about her dress. "It depends on the staging that we will have, and lights that will be used on stage. Both color and design will depend on it. I trust Jose. Surely also it must be a comfortable dress". The rehearsals schedule is out: Edurne to enter Eurovision stage for the first time on Sunday, May 20, at 11 am. Press will be watching this rehearsal on a big screen but Eurovision.tv will have exclusive right to film video. Second rehearsal of the artist will take place three days later on Wednesday, May 20 at 10:50. Press is allowed to attend and film this rehearsal. Public will first see Edurne on stage during dress-rehearsal on Friday. Meanwhile, Edurne continues local promotion tour. This Friday she will attend FesTVal in Murcia to collect the prize for professionals active in social networks. Edurne will be collecting the award on behalf of Eurovision Spain Twitter profile. EBU has released today some photos from postcards of the artists, who have already finished filming 2nd part of their postcard in Austria, where Edurne experienced the impressive animals in a very memorable way. 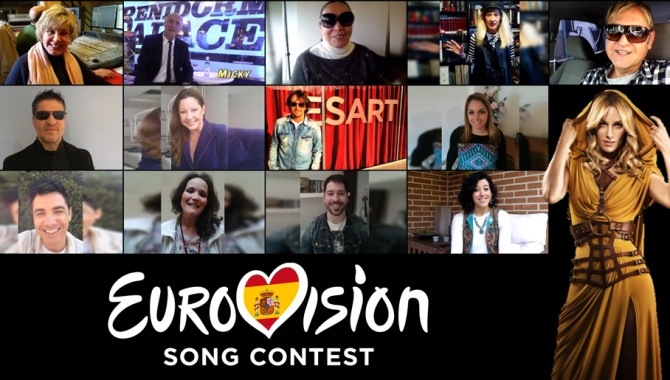 Different former Spanish representatives in the Eurovision Song Contest have appeared in a special video supporting Edurne. A total of 13 artists (contestants of ESC 1971, 1977, 1979, 1980, 1988, 1992-1995, 2000, 2001, 2005, 2007, 2011) came together to show their support for Spanish ESC 2015 representative. The video has been put up together by Eurovision fan and editor of OGAE Spain website Juan Calandria from Seville. During days of "Vienna Sphere" tour in Barcelona, Spain, Spanish Eurovision representative Edurne got the chance to meet ESC 2014 winner Conchita Wurst. "It was a pleasure to meet Conchita and I have loved talking to her. ", said Edurne. The divas have exchanged compliments and shared their experiences of Eurovision participation, promising to meet each other in Vienna again. Tomorrow at 13:30 Edurne will attend live RTVE.es online program Edurnevisión, answering questions that fans sent live via Twitter with the hashtag #VideoclipEdurne. In the program, presented by Paloma G. Quiros, will be analyzed the music video, the audience's reaction on the song and Edurne will discuss her upcoming agenda. In the Monumental Theatre of Madrid was recorded a different, symphonic-choral version of "Amancer". In the recording was involved now complete Orchestra and Choir of RTVE directed by maestro Pepe Herrero, responsible also for arranging of the song for Eurovision. RNE – Radio Nacional de España was responsible for the sound recording of the Orchestra and musical score. "I feel very lucky to sing with the Orchestra and Choir of RTVE. With them the song grows, it becomes even more epic, more intense", said Edurne. "It was an unforgettable experience. It has been very exciting, I almost could not even sing". The recording has been attended by EBU's general director Ms. Ingrid Delentenre and EBU's Institutional Relations Director Giacomo Mazzone. Watch video from this recording here. Spanish broadcaster RTVE has presented today Spanish entry "Amanecer" written and produced by Thomas G:son, Tony Sánchez-Ohlsson and Peter Boström, a song that speaks of sufferings caused by a lost love. Production of "Amanecer" had epic dimension, all electronic resources - the arrangements and programming - were in hand of one of the most experienced teams of Spanish/Swedish producers; and organic resources - RTVE Symphony Orchestra - added the instrumental sensitivity in a recording conducted by maestro Pepe Herrero. The recording of "Amanecer" took place in several cities. In Stockholm - the bases and programming; Edurne's vocal was recorded in Barcelona; symphonic string section in the Teatro Monumental in Madrid with the RTVE Orchestra. All sessions were mixed in Sweden, and the final master was made ​​by Björn Engelmann at Cutting Room studios in Stockholm. Earlier this week, experts Rosa López, Anne Igartiburu, Elena S. Sánchez, Martín Barreiro and José Ramón Pardo got the first chance to listen to Spanish entry. Anne Igartiburu said the song sounded like a powerful war cry adding that "It will receive votes from other countries, has a very catchy chorus". Rosa López was completely feeling the song: "Awesome, the song is great and she has a great voice". Elena S. Sánchez (Spanish spokesperson 2011-2012) commented that even though "Amanecer" is completely in Spanish, everybody will get the chorus in Europe "That's a good sign, I could hum the chorus easily. And the theme of the song is very universal, who has not had a heartbreak?". "This song is going to be number 1 in Spain before the contest, for sure. It has plenty of power", said José Ramón Pardo. For Martin Barreiro the song "has many shades, is intense... It's a song that grows". Tomorrow the song will be available for purchase on various digital platforms, and "Amanecer" music video will be released on 9 March. Edurne has also receive a surprise Eurovision package with mysterious gift that has to do with her dreams and hobbies - that means she has recorded in Madrid the first part of her Eurovision postcard. Edurne's dream will come true in Austria, in the mountains of Tyrol, where in the coming days second part of the postcard will be filmed. RTVE continues to tease Eurovision fan audience, presenting them first 10 seconds of "Amanecer" music video. The date is now set - "Amanecer" of Edurne to be released on 1 March 2015 on RTVE Eurovision website. The next day, 2 March, it will be available for purchase at all major music platforms. • If it was a color, it would be antique gold. • If it was a place, it would be a place where no one has been, as a desert in the ocean or a sea in a forest. • If it was an animal, it would be a majestic bird. In the upcoming days RTVE also plans to release new details of it's entry, including first images from the music video. Edurne is also preparing to release lyric video for her entry, and to illustrate that she has asked all her fans to send in a picture of your favorite dawn. It can be done via e-mail: aquilatierra@rtve.es, to Facebook or Twitter. "Amanecer" already sounded so good and it was difficult to improve the track, but now with the music of the Orchestra and Choir of RTVE it has reached a totally new level, that comes straight to the heart, says Edurne. The string section of the orchestra consists of 22 violins, 8 violas, 6 cellos and 4 basses. During recording at the Teatro Monumental, Edurne was unable to hide her excitement: "It's so exciting that I can not even describe the feeling I have for it, it's a mixture of joy and total excitement...". "It's a song with some drama and a certain ethnicity and not at all typical for what is usually performed at Eurovision"
A complete symphonic version of "Amanecer" will be recorded as well with the complete Orchestra and Choir. "I do not know how I'll be able to sing, since it's going to be so exciting and definitely one of the best experiences of my life. It will be a totally unique and magical version", says Edurne. Edurne ya ha grabado el videoclip de "Amanecer"
Shootings for "Amanecer" video have been completed. RTVE crew followed the process, and you can watch interview with Edurne and some backstage shots from shootings above. Those present at shootings are said to be impressed by the Spanish entry: "It has strength, the hook, catchy on first listening and has the universal message". Music video has been shot in Valencia directed by Germán de La Hoz and David Arnal, who have been working on it since November. Edurne is delighted with the outcome: "We had the opportunity to create not just a small story, but to go the the biggest extent as possible. We're preparing things in 3D...", says the singer. "It is a video clip that catches your eye, so hope it becomes a hit in Europe", she adds. Edurne, who will have no less than 4 costume changes in the video, describes her style in the music video as "Greek warrior". In the video she will be joined by other co-star, a famous person, whose name is not yet revealed. There still will be several weeks before the video is presented to public, it is planned for the late February. RTVE Orchestra will work closely with Edurne and her team, recording the string section of the pop version of the song at the Teatro Monumental in Madrid. It is also planned to record in March a symphonic-choral version. Post-production of the song will take place between Spain and Sweden. Эдурне Гарсия Алмагро родилась 22 декабря 1985 года в Мадриде. С раннего возраста она интересовалась музыкой, и часто ходила с родителями и друзьями в караоке клубы. С раннего детства она стала принимать участие в различных кастингах и прослушиваниях. В 9 лет она вошла в состав детской музыкальной группы "Trastos", вместе с которой выпустила три альбома. Также она снялась в небольших ролях в таких сериалах, как "Hospital Central" (2002) и "Ana y los 7" (2003). В конце 2005 года Эдурне проходит прослушивание и становится участницей 4го сезона реалити шоу "Operación Triunfo". Она продержалась в нем до 12го эфира, в итоге заняв 6е место. После шоу Эдурне подписала контракт с лейблом Sony BMG Испания и выпустила свой первый студийный альбом "Edurne" (2006). Альбом достиг третьего места в испанских чартах в первую неделю своих продаж, и всего разошелся тиражем в 60 тысяч экземпляров, получив статус "Золотого диска". Заглавный сингл с альбома "Despierta" дебютировал на пятой строчке чартов. В 2007 году вышел второй альбом певицы "Ilusión", заглавным синглом с которого стала композиция "Ven Por Mí". 4го июня 2008 года в свет появляется третий альбом Эдурне "Première", на который в основном вошли песни из популярных мюзиклов. Заглавным синглом с него стала композиция "Un Poco de Amor", испанская версия трека "Somebody to Love" группы Queen. "Sigo Enamorada de Ti" ("Безнадежно предана тебе") и "Tú serás para mí" ("Ты тот, кого я хочу") - испанские версии саундтрека к мюзиклу "Grease" стали следующими синглами. Эдурне исполняет роль Сэнди в испанской постановке "Grease, El musical de tu vida" в 2007-2009 и 2011-2013 годах. В 2010 году в свет выходит четвертый альбом певицы "Nueva Piel", содержащий в основном треки в стиле данс и поп, синглами с которого стали "Soy Como Soy" и "Oigo Mi Corazón". Жиск занимает 16ю строчку в списке самых продаваемых альбомов и достигает 2го места по цифровым закачиваниям на iTunes. В этом же году Эдурне принимает участие в шоу "¡Más Que Baile! ", испанской версии "Танцев со звездами", где занимает второе место в финале. Пятый альбом певицы "Climax" выходит 24го сентября 2013 года, а заглавным синглом с него становится трек "Pretty Boy". Эдурне работала над записью этого альбома в Лондоне и Стокгольме с продюсерами Пабло Наварро и Саймоном Нордбергом. В декабре 2013 года Эдурне сотрудничает над записью трека "Hand On Heart" с Олли Мурсом. В 2013 году она принимает участие в третьем сезоне телешоу "Tu Cara Me Suena", испанской версии шоу перевоплощений "Один в один", и становится его победительницей исполнив в финале "Hurt" Кристины Агилеры и набрав 60% голосов телезрителей. После этого она также выступает в качестве специальной гостьи на португальской версии этой программы. С июня по декабрь 2014 года Эдурне вместе с Хави Родригесом является ведущей юмористического шоу "Todo va bien", выходящего на телеканале Cuatro. Она покинула шоу в конце года, чтобы сфокусироваться на своей музыкальной карьере и участии в Евровидении. За время своей музыкальной карьеры Эдурне один раз номинировалась на престижную премию 40 Principales, в качестве "Лучшей новой исполнительницы" в 2006 году. Она также была номинирована на звание "Лучшей поп-певицы" на Cosmopolitan Awards 2008, "Певицы года" на "Must! Awards 2010" и "Артиста года" на "Must! Awards 2011". Она становится обладательницей премии "Must! Awards 2011" за "Лучший видеоклип" на песню "Oigo mi corazón" и "Женский Голос Года" на "Propolis Awards 2014". Эдурне, которая была провозглашена "Самой сексуальной женщиной года" в Испании в 2010 году читателями журнала FHM, последние четыре года встречается с голкипером футбольной команды Manchester United Давидом Де Хеа. 14 января 2015 года было официально объявлено, что Эдурне была выбрана внутренним отбором представительницей Испании на Евровидении 2015 с песней полностью на кастильском диалекте испанского языка "Amanecer" (Заря). Сама певица описала свою композицию как песню в стиле "качественный поп". Песня также войдет в шестой студийный альбом певицы, который она начала записывать с продюсером Тони Санчез-Ольссоном в январе. Автором песни является Тони Санчез-Ольссон (автор песен Испании на Евровидении 2007 и 2012) в сотрудничестве с Питером Бостремом (песни Норвегии и Швеции на Евровидении 2012) и Томасом Г:соном. Для Г:сона это будет уже 9я песня на Евровидении (Швеция 2001, 2006, 2012, Испания 2007, 2012, 2015, Норвегия 2007, Дания 2010, Грузия 2013). На пресс-конференции певица рассказала, что влюбилась в свою песню с самого первого прослушивания, и именно песня стала основной причиной того, что она согласилась на предложение телеканала RTVE. "Все остальное последовало уже за появлением песни. Я уверена, что она может сработать на Евровидении, даже если она отличается от того, что обычно можно услышать на этом конкурсе. Но с этой инновацией мы получим возможность занять первое место". Видео конференции с Эдурне вы можете увидеть здесь (на испанском языке). "Я очень рада и с нетерпением жду мая, чтобы выложиться на полную. Возможно, это самое важное событие, что когда-либо происходило в моей карьере. Я знаю, что это важный вызов и большая ответственность, и подойду к нему со всей серьезностью. Я буду счастлива занять наилучшее возможное место. Я еду побеждать. Если ты не хочешь победить, то нечего и участвовать в конкурсе. Поэтому, моя задача - стать номером один!" TVE покажет оба полуфинала конкурса Евровидение 2015 года на La 2, комментатором финала шоу на La 1, как ожидается, вновь станет Хосе Мария Иньиго, к которому присоединится Юлия Варело. Также стало известно, что членский взнос Испании за право участвовать в конкурсе в этом году составит 356 тысяч евро. В рамках интернет программы #Edurnevision было презентовано эксклюзивное видео на симфоническую версию песни "Amanecer", которая была записана в театре Monumental в Мадриде в марте. Участие в Евровидении 2014 обошлось телеканалу RTVE в 386,994 евро, как стало известно сегодня из ответа президента телекомпании Хосе Антонио Санчеса на запрос Парламента Испании. Эта сумма несколько выше потраченной в 2013 году - 379,893 евро. До снижения в 2013 году, расходы канала каждый год росли: 382,742 евро в 2010, 418,102 в 2011 и 426,483 в 2012. Что же касается этого года, то президент RTVE сообщает, что окончательный бюджет пока не определен. Известно, что RTVE заплатит 356,000 евро за то, что Эдурне и песня "Amanecer" примут участие в конкурсе, но пока эта сумма не включает в себя перелета, проживания и других расходов, с которыми испанской делегации придется столкнуться в Вене. Несмотря на то, что суммы кажутся довольно высокими, участие в Евровидении, несомненно, является прибыльным для вещателя. В прошлом году за финалом конкурса следило 5.141 млн зрителей (доля 35.2%), что сделало его самым просматриваемым неспортивным событием года в Испании. Участие в Евровидении стоит также в два раза дешевле, чем производство шоу Cuéntame или Águila Roja (между 700,000 и 800,000 евро), и намного меньше, чем покупка прав на показ спортивных соревнований. Например, один матч сборной Испании по футболу обходится общественному вещателю в 1.95 млн евро. Сегодня в Малаге прошла пресс-конференция, на которой был презентован исполнитель и официальная тематическая песня Тура Испании - Вуэльты. Ею стала конкурсная песня Испании на Евровидении 2015 "Amanecer" в исполнении Эдурне. Велотур Вуэльта пройдет в этом году с 22го августа. С завтрашнего дня певица приступит к съемкам официального промо-видео для него, они пройдут в различных местах провинции Малага, а премьера его ожидается в ближайшее время на телеканале TVE. "Я невероятно рада тому, что история "Amanecer" не прекратится с Евровидением, ее будут играть все лето"
говорит певица, считающая, что ее конкурсная песня передает всю ту силу и энерию, которая необходима для участия в испанской многодневной велогонке. Джузеппе Ди Белла был представлен в качестве танцора, который будет сопровождать испанскую певицу Эдурне на сцене Евровидения. Джузеппе родился в Сицилии 28 лет назад и перебрался в Испанию 8 лет назад как студент по программе Erasmus. Он обучался праву в Мадридском Университете и сейчас имеет диплом юриста в сфере шоу-бизнеса. Однако, после завершение института он решил сфокусироваться на своей главной страсти: танцах. В Испании он получил возможность принять участие в нескольких десятках телевизионных программ, включая такие программы на телеканале TVE, как El disco del año 2009, Con el vértigo en los talones, ¡Estamos contentos? и Amar en tiempos revueltos. Также он работал в театре в составе труппы 40 El Musical и Dance Company Aguanile. Его профессиональный опыт также включает в себя роли в кинофильмах Solo química Альфонсо Альбасете и Torrente 4 Сантиаго Сегуры. Помимо танцев, в настоящее время совмещает свою сценическую работу с работу радио-ведущим программы Sospechosos Habituales. Ди Белла принимал участие в съемках видеоклипа на песню "Dancing in the rain" (Евровидение 2014). Джузеппе Ди Белла и Эдурне уже несколько раз работали вместе над различными проектами. Эдурне приступила к активным репетициям своего сценического выступления в студии RTVE в Прадо дел Рэе. Ее репетиции записываются и отправляются технической команде Евровидения, которая в свою очередь постарается сделать так, чтобы выступление с "Amanecer" выглядело на экране впечатляюще. Сама певица не разглашает никаких деталей: "Я хочу, чтобы магия выступления стала сюрпризом для всех зрителей. Я счастлива, что мы смогли найти ключ к тому, чтобы сделать его элегантным, но в то же время сильным. Хотя до конкурса все еще остается два месяца - для меня - это самое главное", объясняет Эдурне. Эдурне помогает профессиональная команда хореографов, танцоров и актеров. Впервые певица исполнит свою композицию вживую 6го апреля в программе "Alaska y Segura", выходящей на телеканале La 1 в 23:50 местного времени. Эдурне не хочет, чтобы с ней произошла та же история, что случилась с Рут Лоренцо в Копенгагене, когда ей пришлось в последний момент сменить свое платье, ранее специально сшитое для этого выступления, поэтому команда Испании тщательно изучает все вопросы о том освещении, которое будет задействовано на сцене Wiener Stadthalle. На данный момент известен только дизайнер костюма - Хосе Фуэнтес из Барселоны. Он также занимался подготовкой костюмов Эдурне для клипа на песню "Amanecer". "Это будет потрясающим платьем, вся Европа будет поражена," говорит Фуэнтес Рафе Муньозу, ведущему модного блога "La vida al bies" на сайте rtve.es. "Эдурне очень открыта и любит выслушивать точки зрения других людей", добавляет он и и завершает "главным сюрпризом в Вене станет прежде всего сама Эдурне". Певица уже совершила несколько визитов в "Atelier de Fuentes" и говорит о своем платье следующее: "Это зависит от того номера, который у нас будет, и от света, который будет использоваться на сцене. И цвет, и дизайн будут отталкиваться от этого. Я доверяю Хосе. Конечно же, платье должно быть и удобным". Стало известно расписание репетиций: Эдурне впервые выйдет на сцену Евровидения в воскресенье, 20 марта в 11 утра. Пресса сможет наблюдать за этой репетицией на большом экране, но вебсайт Eurovision.tv будет обладать эксклюзивным правом видеосъемки на ней. Вторая репетиция певицы пройдет через три дня - в среду, 20 мая, в 10:50. Эту репетицию пресса сможет посетить вживую и проводить на ней видеосъемку. Публика впервые увидит Эдурне на сцене во время генеральной репетиции финала шоу в пятницу. Тем временем, Эдурне продолжает местный промотур. В эту пятницу она посетит FesTVal в Мурсии, где получит приз профессионалам, активным в социальных сетях. Эдурне он будет вручен, как представительнице официального твиттер-аккаунта Евровидения - Испании. ЕВС опубликовал сегодня некоторые фотографии с визиток артистов, которые завершили уже съемки 2й части своей открытки в Австрии, где Эдурне встретилась с животными очень запоминающимся способом. Ряд бывших представителей Испании на Евровидении снялись в специальном ролике в поддержку певицы Эдурне. Всего 13 исполнителей (конкурсанты 1971, 1977, 1979, 1980, 1988, 1992-1995, 2000, 2001, 2005, 2007, 2011 годов) согласились поддержать представительницу Испании на Евровидении 2015. Автором проекта является испанский поклонник Евровидения, редактор вебсайта ОГАЕ Испания, Хуан Каландриа из Севильи. Во время дней проведения в Барселоне мероприятия "Vienna Sphere", представительница Испании Эдурне смогла встретиться с победительницей Евровидения прошлого года Кончитой Вурст. "Для меня было огромным удовольствием встретиться с Кончитой и мне очень понравилось общаться с ней", говорит Эдурне. Дивы обменялись комплиментами и поделились своим опытом от участия в Евровидении, пообещав вскоре снова встретиться в Вене. Завтра, в 15:30 Москвы Эдурне примет участие в онлайн программе RTVE.es Edurnevisión, где ответит на вопросы поклонников певицы, заданной ей через Twitter с хэштегом #VideoclipEdurne. В программе, которую проведет Палома Куирос, будут проанализированы видеоклип певицы, реакция поклонников на ее конкурсную песню, а сама она поделится предстоящими планами своей программы подготвки к конкурсу. В театре Monumental в Мадриде прошла запись дополнительной, симфоническо-хоровой версии песни "Amancer". В записи также принимал участие на этот раз полный Оркестр и Хор RTVE, под управлением маэстро Пепе Эрреро, который также создавал аранжировку для конкурсной версии песни. За аудиозапись оркестра отвечало Национальное Радио Испании. "Я счастлива получить возможность спеть с Оркестром и Хором RTVE. С ними песня еще больше растет, становится мощной, эпической, говорит Эдурне. "Это был невероятный опыт. Было очень увлекательно, настолько, что я с трудом могла петь". Запись посетили генеральный директор ЕВС Ингрид Делентенре и Директор по институциональным связям ЕВС Джакомо Маццоне. Любительское видео с записи оркестровой версии песни можно увидеть здесь. Испанский вещатель RTVE представил сегодня вниманию публики песню "Amanecer", написанную и спродюсированную Томасом Г:соном, Тони Санчесом-Ольссоном и Петером Бостремом, песню, которая рассказывает о страданиях от потерянной любви. Продакшн "Amanecer" имел воистину эпические размеры: все электронные ресурсы - аранжировки и программинг - были в руках одной из самых опытных команд испанско/шведских продюсеров, а органические ресурсы - симфонический оркестр RTVE - добавил инструментальной чувственности в записи, проведенной маэстро Пепе Эрреро. Всего же работа над "Amanecer" проходила в нескольких городах: в Стокгольме - основная часть, вокал Эдурне был записан в Барселоне, струнная симфоническая секция в Teatro Monumental в Мадриде с оркестром RTVE. Все эти сессии были смикшированы в Швеции, а окончательный мастеринг создал Бьорн Энгельманн в Cutting Room студии в Стокгольме. Ранее на этой неделе первое право прослушать песню получили испанские эксперты Роза Лопез, Анне Игартибуру, Елен Санчез, Мартин Баррейро и Хосе Рамон Пардо. Игартибуру отметила, что песня звучит как мощный боеваой клич, добавив, что "она получит голоса от многих других стран, у нее очень запоминающийся припев". Роза Лопез полностью прочувствовала песню: "Здорово, отличная песня, и у нее прекрасный голос". Елена Санчез (глашатай Испании в 2011-2012 годах) прокомментировала, что несмотря на то, что песня исполняется полностью на испанском, ее припеву сможет подпеть любой слушатель в Европе: "Очень хороший знак, я смогла с легкостью напеть припев. И тематика песни тоже универсальная, кто из нас не испытывал страданий от любви?". "Эта песня несомненно возглавит испанские чарты еще до конкурса. Она очень мощная", говорит Хосе Рамон Пардо. Для Мартина Баррейро песня "имеет множество оттенков, очень интенсивная... усиливает свое впечатление с каждым прослушиванием". Завтра песню можно будет приобрести на цифровых платформах, а видеоклип на "Amanecer" будет представлен 9го марта. Эдурне также получила посылку-сюрприз от организаторов Евровидения с неожиданным подарком, который имеет какое-то отношение к ее мечтам или хобби. Это означает, что в Мадриде прошла первая часть съемок посткарда, который будет предварять выступление представительницы Испании. Мечта Эдурне-же теперь должна будет осуществиться в Австрии, в Тирольских горах, где в ближайшем будущем пройдут съемки второй части посткарда. RTVE продолжает дразнить поклонников Евровидения, представляя им первые 10 секунд видеоклипа на песню "Amanecer". Объявлена дата премьеры трека "Amanecer" Эдурне. Он впервые будет представлен публике 1го марта 2015 года на сайте телеканала RTVE. На следующий день, 2го марта, песню можно будет приобрести на всех крупнейших цифровых музыкальных платформах. • Если бы она была цветом, то стала бы античным золотом. • Если бы она была местом, то стала бы местом, где никто не бывал, например, пустыней в океане или морем посреди леса. • Если бы она была животным, то стала бы величественной птицей. • И если бы она была чувством, то это чувство было бы душераздирающим. В ближайшие дни RTVE опубликует новую информацию о конкурсной песне Испании, включая первые кадры со съемок видеоклипа на нее. Эдурне также готовит к выпуску lyric video на свою композицию, и для того, чтобы дополнить ее текст, певица попросила всех своих поклонников присылать ей кадры своих самых любимых рассветов. Это можно сделать на e-mail: aquilatierra@rtve.es, на Facebook или Twitter. "Amanecer" уже звучала настолько хорошо, и казалось сложным улучшить саму песню, но теперь с музыкой, записанной Оркестром телеканала RTVE она достигла совершенно нового уровня, проникающего прямо в сердце, говорит Эдурне. Струнная секция оркестра состоит из 22 скрипок, 8 виол, 6 виолончелей и 4 контрабасов. Во время записи в Teatro Monumental, Эдурне не могла скрыть своей радости: "Это настолько потрясающе, что я просто не могу описать свои чувства, это смесь радости, волнения и возбуждения.". "В этой песне есть определенная драма, определенная этничность, и она совершенно нетипична среди того, что обычно исполняется на Евровидении"
При участии полного Оркестра и Хора RTVE будет записана и полная симфоническая версия трека. "Я не знаю, как я смогу петь, это будет так волнительно, и без сомнения одним из самых интересных переживаний в моей жизни. Это будет совершенно уникальная, волшебная версия", говорит Эдурне. Завершены съемки видеоклипа на песню "Amanecer". Съемочная группа канала RTVE следила за процессом, и вы можете увидеть интервью с Эдурне и некоторые закулисные кадры со съемок клипа выше. Те, кто присутствовал на съемках, были впечатлены испанской композицией: "В ней есть сила, хук, она запоминается с первого слушания и несет в себе универсальный посыл". Режиссерами видеоклипа, съемки которого прошли в Валенсии, стали Херман де ла Оз и Давид Арналь, работавшие над ним с ноября. Эдурне очень довольна получившимся результатом: "У нас была возможность создать не просто маленькую историю, но зайти так глубоко в детали, насколько это возможно. Мы также работаем над некоторыми фишками в формате 3D...", говорит певица. "Это - видеоклип, который немедленно захватывает внимание, потому, надеюсь, что он сможет стать хитом в Европе", добавляет она. Эдурне, которая за время клипа сменит не менее 4х костюмов, описывает свой стиль в клипе как "греческую воительницу". Помимо нее самой, в клипе будет присутствовать и еще одна звезда, известная личность, чье имя пока не разглашается. Презентация клипа широкой аудитории пройдет через несколько недель и ожидается в конце февраля. Оркестр испанского телевидения RTVE будет работать вместе с Эдурне и ее командой над записью струнной секции поп-версии песни, которая пройдет в Teatro Monumental в Мадриде. Также в марте планируется записать более масштабную симфоническую версию композиции. Пост продакшн песни будет проводиться в Испании и Швеции.